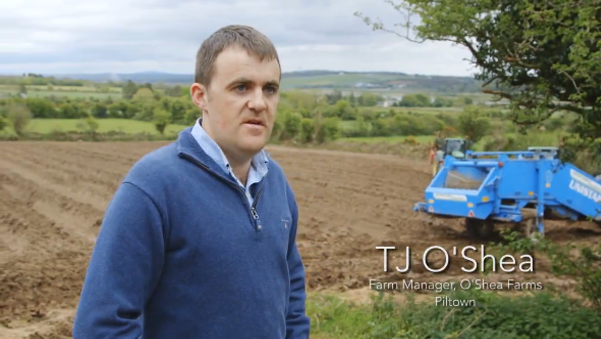 TJ is a potato and carrot grower, based in Piltown, Co. Kilkenny. Find out more by taking a virtual video tour of the farm. I’m a fifth generation farmer in the Piltown area. Since the early 1830s, the O’Shea family have been farming the land in the South East. From an early age, I was brought out to the fields to check on the progress of our crops and I learned a great deal about the business from my father. We’re currently farming approximately 1800 acres, with potatoes and carrots being the main crops planted on the land. We are blessed here in the Suir Valley; we are farming on clay loam soil, which produces very high yields of very good quality crops. The main variety of carrot we grow is called Nairobi which is a very sweet variety and one which people really enjoy eating. We start harvesting at 5.30am each morning, to ensure we have fresh carrots daily. The carrots are then washed, cooled, packed and dispatched that very same day. We have over 150 people employed between growing, washing, packing and distributing our produce. We are therefore, very passionate about supporting “local” where and when possible. I’m very proud of the produce we grow and we work to ensure we provide the freshest and tastiest produce we can. After all, taste really is king! Working with Total Produce is very important to us. Our partnership, allows us to focus on producing top quality produce. It is a mutually beneficial relationship and we benefit greatly, from the Agronomic, Commercial and Marketing support that Total Produce provides. I am situated in Piltown, Co. Kilkenny. I am located 35 minutes from Kilkenny City Centre and 5 minutes from the nearest Total Produce depot.